I had just 100 grams of this lovely soft 2 ply handspun. It is wool and mohair from "Warm and Wonderful". This is the link http://www.warmandwonderful.com/ but it seems to be temporarily down. Her mittens were stiff and scratchy but the yarn was so nice that I bought it anyway. I thought it might be a gauge thing and I was right. As soon as I loosened the gauge up, the soft fuzzy nature of the yarn came out. So here is my adjusted pattern. I took this from several sources...combined to make it my own. Gauge - 13 stitches to 4 inches/10cm, 16 rows to 4 inches/10 cm. I used a long tail cast on to give it a bit of a chain look at bottom. Join in the round and place a marker to show beginning of round. Row 1 - K2, place marker, M1, K2, M1, place marker, knit to end of round. (26 stitches). Row 3 - K2, slip marker, M1, K4, M1, slip marker, knit to end of round. (28 stitches). Row 5 - K2, slip marker, M1, K6, M1, slip marker, knit to end of round. (30 stitches). Row 7 - K2, slip marker, M1, K8, M1, slip marker, knit to end of round. (32 stitches). Row 9 - K2, slip marker, M1, K10, M1, slip marker, knit to end of round. (34 stitches). Row 11 - K2, remove marker and put 12 thumb stitches on waste yarn or stitch holder. CO 2 stitches on right needle using backward loop method (as in Elizabeth Zimmerman style cast on). Knit to end of round. And somewhere in this section I added another marker at exactly 12 stitches from the one marking the beginning of the round. So I would line up the finger tip decreases. This also brought the mitt to the end of the pinky finger. This is just a basic decrease method that I use for mittens and socks. Feel free to substitute your favorite decreases. Cut yarn and thread through the remaining 6 stitches, tighten up hole and fasten off. Replace 10 thumb stitches to needles and pick up 2 stitches from CO2 stitches. Place marker. Round 6 - *k2tog, k1* to end of round. (8 stitches). Round 7 - *k2 tog, k1* to end of round. (4 stitches). Cut yarn and thread through the 4 stitches. Tighten hole and fasten off. CO 24 stitches and knit 12 rounds. Row 1 - K20, place marker, M1, K2, M1, place marker, k2. (26 stitches). Row 3 - K20, slip marker, M1, K4, M1, slip marker, k2. (28 stitches). Row 5 - K20, slip marker, M1, K6, M1, slip marker, k2. (30 stitches). Row 7 - K20, slip marker, M1, K8, M1, slip marker, k2. (32 stitches). Row 9 - K20, slip marker, M1, K10, M1, slip marker, k2. (34 stitches). 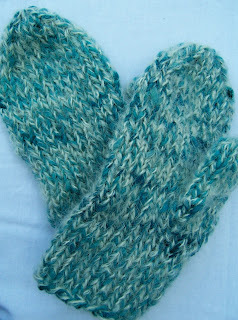 Knit 12 rounds plain and finish as per right mitten. I know this is just a basic mitten. But I couldn't find one exactly as I had it in my head with the numbers I needed. So here is my offering to the knitting cyber space. I've checked it over a few times and can't seem to find any mistakes. If you have problems or corrections, contact me.